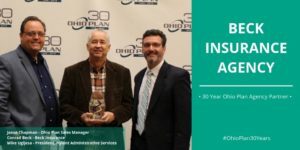 Beck Insurance Agency was recently honored for being a founding member and agency partner with The Ohio Plan. 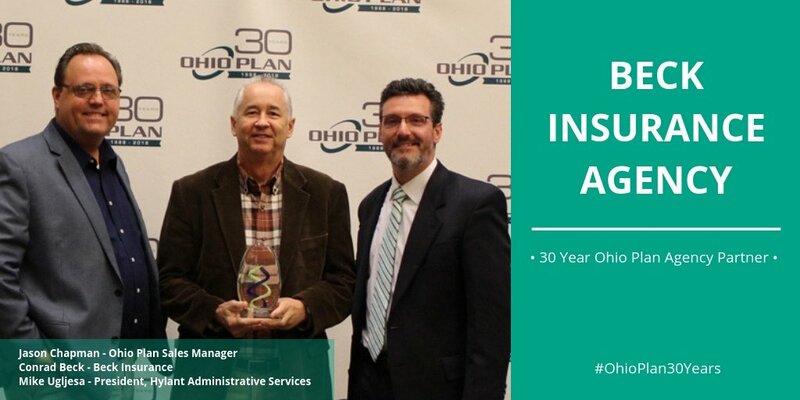 The 30 year partnership between Beck Insurance Agency, The Ohio Plan, Hylant Administrative Services, the other agency partners, and most of all the 200+ Ohio Plan Members has far exceeded our expectations. Conrad Beck was on hand to accept the honor on behalf of Beck Insurance Agency. Here is to 30 more! For more information on Beck Insurance Agency, Conrad Beck, The Ohio Plan & The Ohio School Plan or…….please click here. Conrad can be reached at 419-446-2777, cbeck@beckinsurance.com, or by contacting us here.